Aerial view of Camp Ellis, Table Grove, Illinois, where the 48th Field Hospital was officially activated 10 September 1943. The organization would stay at the Camp until 8 November 1943. The 48th Field Hospital was officially activated on 10 September 1943 at Camp Ellis, Table Grove, Illinois (Army Service Forces Training Center; total acreage 17,503; troop capacity 1,795 Officers and 24,654 Enlisted Men –ed), per Letter, War Department, AGO, File AG 322, dated 31 August 1943, OB-I-SPMOU-M, dated 3 September 1943, and General Orders # 54, dated 9 September 1943, Headquarters Army Service Forces Unit Training Center, Camp Ellis, Table Grove, Illinois, under T/O dated 8 April 1943. The first CO, assisted by 2 other Officers, was re-assigned just a few days after activation, and departed leaving First Lieutenant Eldon E. Whalen, MAC, O-451061 in command as from 14 September 1943. The Officer, almost unaided, took up the task of organization until arrival of Major Robert J. Hoagland on 17 September 1943. A new Table of Organization for Field Hospitals, T/O 8-510 was printed bearing the date of 28 September 1943. The following Field Hospitals – 39th Field Hospital (assigned to Sixth Service Command) – 47th Field Hospital (assigned to Fourth Service Command) – 48th Field Hospital (assigned to Fourth Service Command) – were re-organized on 12 November 1943, 26 November 1943, and 26 November 1943 respectively in accordance with T/O 8-510, dated 8 April 1943, and Circular # 99, War Department 1943, each with an official authorized strength of 20 Officers – 18 Nurses – and 190 Enlisted Men. Reorganization was effectively conducted under T/O & E 8-510, dated 28 September 1943, as per orders and confirmed to the Mobilization Division, Army Service Forces, Washington D.C., by Letter dated 31 December 1943, signed by Major Robert J. Hoagland, MC, O-20516, Commanding. Members of the 48th Field Hospital take a break in front of one the Enlisted Men’s barracks. They hold 4 new-born puppies in their liners. The cadre for the unit came from Camp Joseph T. Robinson, Little Rock, Arkansas (Infantry Replacement Training Center; total acreage 42,124; troop capacity 2,596 Officers and 44,077 Enlisted Men –ed). The other Enlisted Men (of whom 97% were selectees) came chiefly from MRTCs immediately after completion of Basic Training. A minority were from named General Hospitals in the Zone of Interior. All Medical Officers, except the Commanding Officer originated from fixed or numbered General or Station Hospitals. The 3 Dental Officers came directly from civilian life. Medical Administrative Officers were all graduates of the Officer Candidate School. All ANC Officers came from fixed Hospitals in the ZI. 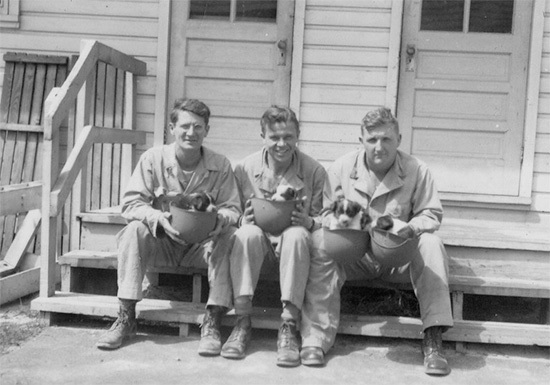 All MC Officers who were originally ordered to join the unit (January and February 1944) were without previous experience in field work, but they and the DC Officers received adequate training after being assigned to the new hospital. The Nurses who joined the 48th Field Hospital were with the organization for several months before its arrival in France and received complete military training. 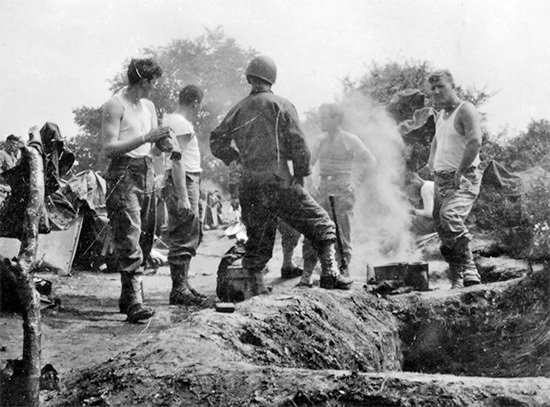 The Enlisted Men who joined the 48th Field Hospital came from many different locations and units such as: 136th Station Hospital (Camp Edwards, Fallmouth, Massachusetts); 1201st Service Unit (Medical Detachment, Fort Jay, New York); Medical Replacement Training Center (Camp Pickett, Blackstone, Virginia); Medical Replacement Training Center (Camp Barkeley, Abilene, Texas); 1238th Service Unit (Willowbrook, Staten Island, New York); Medical Replacement Training Center (Camp Joseph T. Robinson, Little Rock, Arkansas); Army Medical Center, Washington DC); 1257th Service Unit (Tilton General Hospital, Fort Dix, Wrightstown, New Jersey); Medical Detachment Army Air Base (Fort George Wright, Washington); Medical Department Enlisted Technicians School (O’Reilly General Hospital, Springfield, Missouri); Headquarters Medical Administrative Corps, Officer Candidate School (Camp Barkeley, Abilene, Texas); 1613th Service Unit (Camp Grant, Rockford, Illinois); Medical Department Enlisted Technicians School (Fort Benjamin Harrison, Indianapolis, Indiana); Medical Detachment, 1304th Engineer General Service Regiment (Headquarters Engineer Unit Training Center (Camp Sutton, Monroe, North Carolina); Headquarters William Beaumont General Hospital, El Paso, Texas; Headquarters Fitzsimons General Hospital, Denver, Colorado; Headquarters Lawson General Hospital, Atlanta, Georgia; Medical Detachment Camp Myles Standish, Boston, Massachusetts: 3587th Service Unit (Billings General Hospital, Fort Benjamin Harrison, Indianapolis, Indiana); Medical Department Technicians School (Lawson General Hospital, Atlanta, Georgia); and Supply Detachment (Fourth Service Command, Fort Jackson, Columbia, South Carolina). 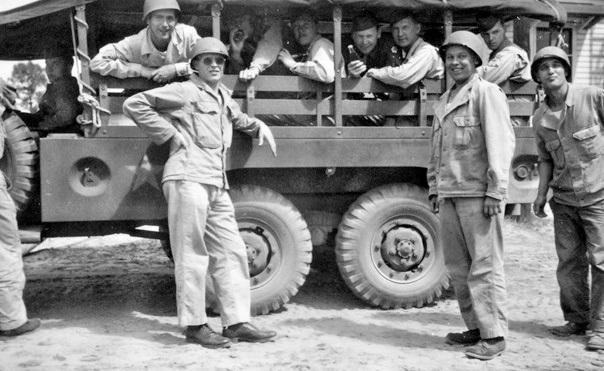 Private Richard T. Wright (12214868 – leaning against the truck), Private Everett Silvia (31383563 – to Pvt Wright’s immediate left), and other personnel of the 48th Field Hospital in training. The vehicle illustrated is a 1 1/2-Ton , 6 X 6, Truck, Cargo & Personnel Carrier, manufactured by the Dodge Brothers Corporation (a Division of Chrysler Corporation). Names, courtesy of Donald L. Wright. The EM underwent unit and technical training while staying at Camp Ellis, Illinois. This training consisted mainly of academic technical training for most men and a repetition of basic training for a minority of them. Hospital Headquarters began to work as one unit. 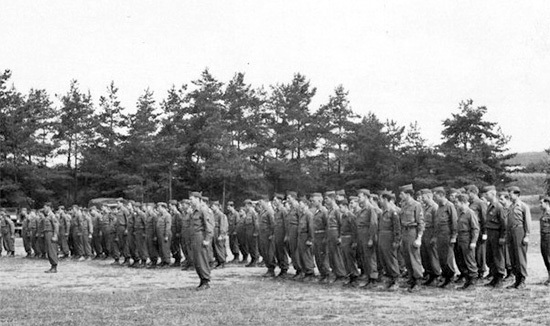 One of the primary activities while at Camp Ellis were the marches. During classes, it was stressed that marching taught discipline, inspired confidence, and increased stamina. During September and October 1943, many marches, interrupted by frequently simulated air and gas attacks at unexpected times, were conducted. Uniforms to wear during the many hikes and marches consisted of fatigues – leggings – helmet liner – gas mask – pistol belt – canteen – and first-aid-packet. The exercises included 6-mile, 8-mile, 9-mile, 10-mile, and 12-mile road marches, which were held during day and night (similar road marches were also organized while staying at Fort Jackson –ed). Partial view of the wooden barracks at Fort Jackson, Columbia, South Carolina, where the 48th Field Hospital was to be stationed from 25 November 1943 to 29 March 1944. On 8 November of 1943, the 48th moved to Laurinburg-Maxton Army Air Base, Maxton, North Carolina, (a temporary change of station) for a two-week course in cargo lashing and rudiments of cargo plane and glider loading technique. After arrival, the men received a very incomplete 400-bed Field Hospital assembly which had already been used by another unit; as a result, boxes were broken, some equipment was damaged, and many shortages were recorded. The first problem to solve was to collect enough of the equipment checked to train with. Due to the above problems, field training did not start before 12 November. Enough equipment to load 13 C-47 aircraft or CG-4A gliders or both was collected and prepared. On alternate days the same amount of equipment had to be re-arranged to make up 17 glider loads. 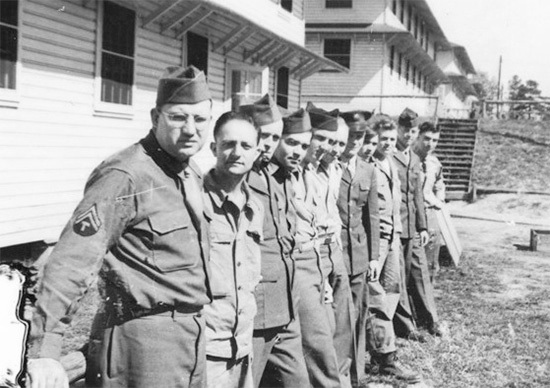 Upon completion of the above training at the Air Base on 24 November 1943, the unit moved to Fort Jackson, Columbia, South Carolina (Infantry Training Center; total acreage 58,653; troop capacity 5,907 Officers and 72,817 Enlisted Men –ed), where training consisted of practical technical work in the Fort Jackson Station Hospital, some as a hospital unit, and including preparation for movement overseas. During the period of training with the hospital equipment, each Platoon (the organization consisted of 3 Hospitalization Units –ed), in turn, used the one available Hospitalization Unit equipment which was still incomplete. The assembly received at Maxton, had to be subdivided in equal components, sets, kits, and chests for the 3 Platoons. Some sets were not even assembled, instruments had been thrown loose in large boxes and some of them had even rusted. It took the 26th Medical Depot Company a total six weeks to functionally pack about 80% of the equipment. Field exercises included moving the unit, and setting it up in darkness, daylight, and inclement weather. Unit Headquarters were organized consisting of 1 MC and 2 MAC Officers, 3 ANC Officers, and 19 EM. Each Platoon had 4 MC Officers, 1 DC, 1 MAC Officer, 5 ANC Officers, and 57 Enlisted Men. At this time work was done on the equipment to better adapt it to the anticipated needs of the hospital (changes and improvements). Authorized strength at the time was set at 22 Officers, 18 Nurses, and 187 Enlisted Men. MTP 8-10 began on 20 September 1943 and lasted until 31 December 1943 (although not completed because of the many moves and the special training at Laurinburg-Maxton AAB –ed). Personnel of the 48th Field Hospital in front of one the barracks at Fort Jackson, Columbia, South Carolina. The 48th Field Hospital’s greatest problem was the medical equipment. Medical equipment (Item No. 97227) arrived in an incomplete and chaotic state. From the time of arrival at Laurinburg-Maxton, where it was received from four different sources, until end December 1943, work was done to re-assemble the equipment, inventory it, assemble lists of shortages and determine serviceability. Measures were instituted to acquire a newly functionally-packed equipment, but the unit was in fact directed to re-organize the equipment themselves with aid from the Post Surgeon and the Atlanta Medical Depot. Boxes were requisitioned as well as packing material by the Post Medical Supply Officer. Unfortunately field training was deferred until the proper medical equipment became available for worthwhile training. In the end, the minimum essential equipment was packed by the Fort Jackson Post Engineer. A complete showdown inspection of the hospital equipment and also of the individual clothing and equipment was conducted at Fort Jackson and later repeated at the Camp Kilmer Staging Area, which unfortunately necessitated much packing and unpacking several times. 48th Field Hospital. 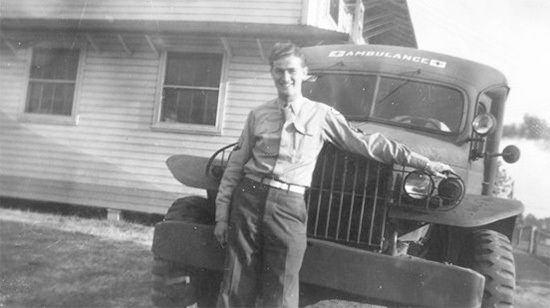 Driver in front of an Ambulance, 3/4-Ton, 4 X 4, Truck, manufactured by the Dodge Brothers Corporation (Division of Chrysler Corporation). It is strange to note that the vehicle shows no unit markings, maybe it was only recently delivered, or it still had to be assigned. Bivouac of the 48th Field Hospital “somewhere” in the field (this photo may have been taken while stationed in the United Kingdom or in France). 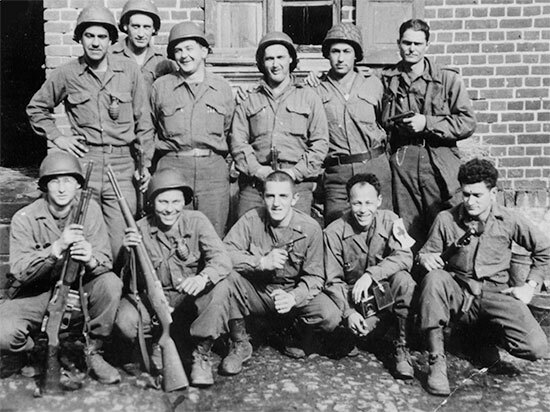 Photograph showing Pvt Richard T. Wright (squatting, second from left) of the 48th Field Hospital, who later transferred to the 35th Infantry Division, where he served as a Browning Automatic Rifle Assistant Gunner. Photograph, courtesy of Donald L. Wright. Drawing illustrating the preferred setup under tentage, developed by the 48th Field Hospital. Pvt. 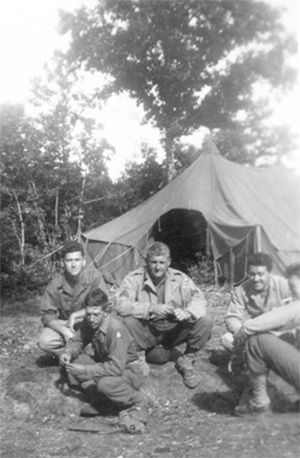 Richard T. Wright (last man kneeling, right) and other personnel of the 48th Field Hospital. Personnel of the 48th Field Hospital bivouacking in France. 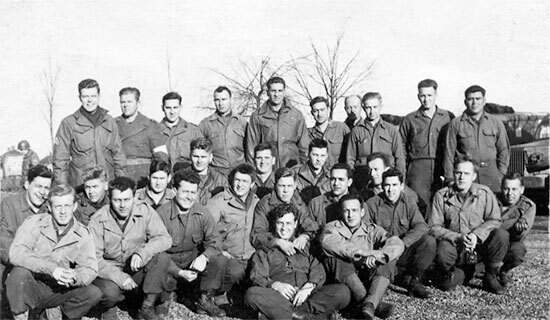 On 29 March 1944, the 48th Field consisting of 22 Officers, 18 Nurses, and 190 Enlisted Men departed from Fort Jackson, South Carolina, with destination Camp Kilmer, Stelton, New Jersey (Staging Area for New York Port of Embarkation; total acreage 1,815; troop capacity 2,074 Officers and 35,386 Enlisted Men –ed). Final preparations for movement overseas were completed at Camp Kilmer with the unit leaving New York Port of Embarkation on 6 April 1944. 48th Field Hospital personnel. 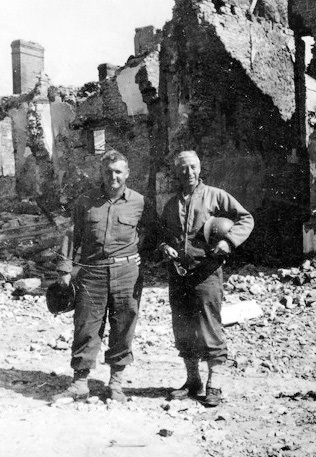 Sergeant Ralph L. Quesinberry (L) and Captain John C. Petrone (R), CO, First Platoon, in Saint-Lô, France. Following an uneventful Atlantic crossing debarkation was accomplished on 16 April 1944 at Glasgow, Scotland. On 17 April 1944, all personnel arrived in Kidderminster, Worcestershire, England. Immediately upon arrival in the United Kingdom, the 48th was transferred from the Army Service Forces to the Third United States Army. While stationed in the United Kingdom, three (3) months were spent in obtaining, working with, and preparing and packing the equipment for overseas shipment and combat use. During the stay in England, the 48th modified the newly issued equipment to better suit the requirements of a field hospital. Each individual Platoon set up its hospital unit numerous times in blackout conditions and adverse weather. They each spent at least 5 consecutive days in the field and under bivouac conditions. 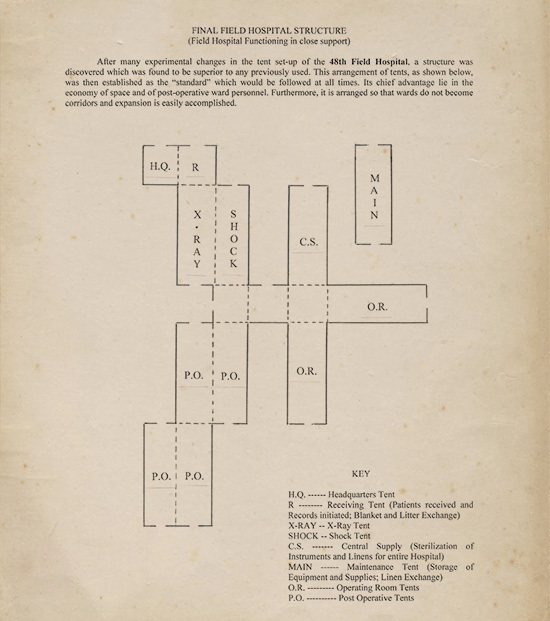 Plans were formulated for three different methods of setting up a Field Hospital. In anticipation to the planned Invasion of the Continent, 12 Officers, 14 Nurses, and 22 Enlisted Men from the 4th Auxiliary Surgical Group were attached to the unit on 7 June 1944. They would leave the organization between 18 July and 10 August 1944. Two (2) American Red Cross workers were assigned to the 48th Field Hospital, while in England, on 17 June 1944. 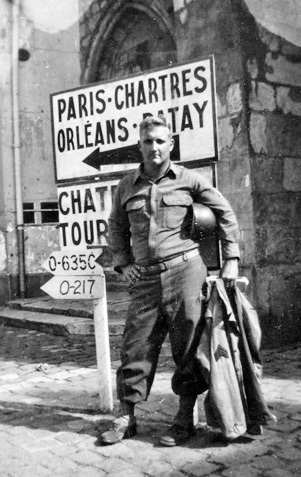 Photo of Sergeant R. L. Quesinberry, member of the 48th Field Hospital’s Surgical Department, while in France. All personnel departed Kidderminster, England, on 10 July 1944, arriving at Seton Barracks, Plymouth, Devonshire, England, the same date. Final preparations for movement to the Continent (France) were made. Before leaving Kidderminster, attempts had been made to have the hospital equipment accompany the staff and personnel. A final decision to leave the equipment under guard in England where it was to be loaded and eventually transported to France by a medical depot was handed down after a telephone conversation with the Transportation Corps Officers at ETOUSA Headquarters in London. The equipment was then left behind with a guard from a nearby hospital unit despite the desire of the 48th’s CO to also leave unit rear guards of the command behind (leaving the equipment in this manner was one of the reasons for its delayed arrival in France, and it was only after much time and correspondence was spent with the Army Surgeon and G-4 Staff that the equipment was located and shipped to Cherbourg, France, where it was unloaded, and unfortunately delayed considerably longer –ed). The 48th Field Hospital left Seton Barracks, Plymouth, and the United Kingdom on 12 July 1944. The 48th arrived in France on 15 July 1944 landing on Utah Beach, Normandy. It spent the first night at St.-Germain-de-Vareville, bivouacking in Transient Area “B”. On 16 July 1944 the organization proceeded to a bivouac area some 2 miles north of Barneville, France, on the west coast of the Cotentin Peninsula where it remained inactive, awaiting receipt of its equipment which would not arrive until 14 August 1944 in France! On the same day, the 48th moved to another bivouac area 2.3 miles southwest of Louvigné-de-Bais, France. After a stay of 10 days, the organization entrucked again to a bivouac area 8 miles south of Brou, France, where it remained inactive until its move to Longuyon, in the Lorraine region, France, which took place on 1 October 1944. View of a portion of the Westwall defenses (aka Siegfried Line) illustrating its antitank defense system. On 1 September 1944, orders were received relieving the 48th Field Hospital of its current assignment and transferring the unit to the First United States Army. On 23 September 1944, another transfer took place, this time involving the Ninth United States Army. During this prolonged period of inactivity, repeated efforts were made through every possible channel and means available to speed up the receipt of the hospital’s equipment. After being unloaded as late as 25 August 1944 (at the port of Cherbourg, Cotentin Peninsula –ed) the equipment was finally shipped to the unit. Following direct appeals to the Surgeon, Twelfth United States Army Group, the hospital equipment was finally loaded on trucks by personnel of the Quartermaster Sorting Warehouse in Cherbourg and hauled to Longuyon, France, where it was finally received on 3 October 1944! From the time of arrival in France and until the first week of October 1944, there was little for the personnel to do. Frequent marches, drills, and administrative classes were held; reveille formations and calisthenics were daily routine. Athletics were stressed. Altogether this long period of inactivity was detrimental to the unit, with little work and limited recreational facilities (most towns were off limits), the morale of the personnel gradually deteriorated. During the period 3 October 1944 to 1 December 1944, teams pertaining to the 5th Auxiliary Surgical Group augmented the personnel of all three Platoons. Until about 1 December 1944, teams were transferred in and out of the units, but following 1 December 1944, team assignment within the Hospitalization Units were stable. It must be underlined that the attached Surgical and Shock Teams from the Auxiliary Surgical Groups were mainly responsible for the professional work in the Hospital. Personnel of the 48th Field Hospital stand around a 3/4-Ton, 4 X 4, Truck, Weapons Carrier, manufactured by the Dodge Brothers Corporation (a Division of Chrysler Corporation). Photo taken while stationed in Germany. On 3 October 1944, Headquarters and Second Platoon moved from Longuyon, France to an area 1 mile north of Arlon, in Belgium, to go into operation for the first time after waiting three months on the Continent. The unit functioned in a manner similar to a station hospital. Constant rain and high winds were experienced. The entire hospital was established under tentage, and after a week of constant rain the ground became a quagmire. Headquarters left Second Platoon and proceeded by motor convoy to an area approximately 2 miles south of Tongres, Belgium, on 21 October, where it set up together with Third Platoon. Again work consisting in station-type hospital operations was done in tents and under severe rain. Latrines became a problem because the water level was never 24 inches below the ground surface. On 21 October 1944 First Platoon departed from Longuyon, France, and entrucked for a new site in the vicinity of Pulderbos, Belgium, where it set up tents in direct support of the 104th Infantry Division, aka “Timberwolves”. This was the first opportunity for any one of the Hospitalization Units to operate a Clearing Station, taking care of the latter’s non-transportable patients. On 26 October 1944 the Platoon eventually departed Pulderbos for another site 2 miles southwest of Sternhoven, Belgium. First Platoon operated behind the lines of the 104th Infantry Division always under canvas – first in Belgium, later in Holland – until it returned to a bivouac area near Crisnée, Belgium, on 16 November 1944. During the above period, it admitted 103 battle casualties and made two moves in order to remain as near the front as was safely possible. Again, the problems caused by the almost daily rainfall and the resulting mud, were numerous. On 23 October 1944 Second Platoon left Arlon, Belgium, to a bivouac area (near Tongres) where Third Platoon was already in operation. 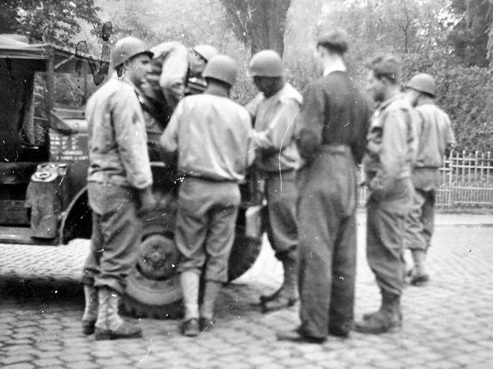 Second Platoon remained in the area for only 8 days after which it moved to Petit-Brogel, Belgium, in direct support of the 7th Armored Division. This Platoon set up under tentage and admitted 31 non-transportable casualties for treatment. Fortunately the ground in this area was sandy. Although strong winds and much rain were still encountered, the ground surface drained readily and no mud was hampering operations. On 31 October 1944 First Platoon departed its bivouac area southwest of Sternhoven, Belgium, for a new area 1 mile south of Wernhout in Holland. On 15 November 1944 Second Platoon closed its operation ¾ mile northeast of Petit-Brogel, Belgium, and moved to a new bivouac situated about 1 mile southeast of Odeur, Belgium. For the first time since arriving on the Continent, a Platoon of the 48th Field Hospital was living in buildings. While staying in bivouacs and rest areas the three Platoons checked equipment and made plans to improve setup for their next move into operation. During their stay in Belgium, all units were subjected to a lot of enemy “flying bomb” activities but fortunately suffered no losses. On 16 November 1944 First Platoon left Wernhout, Holland, and returned to Belgium, setting up ½ mile south of Crisnée. 48th Field Hospital Headquarters departed Tongres, Belgium, on 25 November 1944. In November 1944, and in accordance with Section V, Circular # 201, War Department 1944, as amended by Section III, Circular # 266, War Department 1944, the authorized enlisted strength was decreased from 190 to 182. 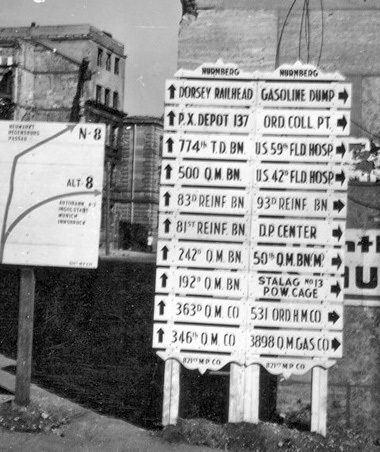 Illustration showing a number of signposts indicating various US Army units stationed in Germany (Nürnberg area). 25 November 1944 Headquarters left Tongres, Belgium, for Alsdorf, Germany, where it was eventually joined by First Platoon, which had moved from Crisnée, Belgium. The Platoon set up in support of the 29th Infantry Division and was still in operation housed in the same buildings supporting the same Division on 31 December 1944. For the first time, First Platoon and Headquarters were set up in permanent type buildings, which required much work for conversion, clearing, and blacking out. On 25 November Second Platoon left its site near Odeur, Belgium, moving to Palenberg, Germany, where it was established in an abandoned school building, partially occupied by a Medical Clearing Company pertaining to the 327th Medical Battalion, 102d Infantry Division. Personnel of Second Platoon was billeted in nearby semi-ruined houses which had been evacuated by German civilians. 3 December 1944 Third Platoon also departed Tongres, Belgium, moving to a large, badly damaged school building in Ubach, Germany. It was to face a gigantic clean-up and black-out task before being able to use the place properly. The Platoon remained open and ready to receive patients from the 7th Armored Division and the 102d Infantry Division until 24 December 1944, when, after receiving only 3 battle casualties, it was housed in buildings in Bocholtz, Holland. On 29 December 1944 Third Platoon returned to Belgium, setting up in empty buildings in Wellen, Limburg region, Belgium, to await further orders, and ready to set up a hospital. It should be noted that due to the Allied advance into Germany and the numerous moves of the individual Platoons, equipment losses and shortages were hard to solve. By 31 December 1944, about 85% of the missing equipment had been replaced. 48th Field Hospital. Reveille formation, somewhere in Germany. 1 January 1945 found Headquarters and First Platoon, 48th Field Hospital set up close to the front at Alsdorf, Germany in support of the 29th Infantry Division. Second Platoon, also near the front, was at Palenberg, Germany, where it provided medical support to the 102d Infantry Division. Third Platoon was in bivouac at Wellen, Belgium. The winter lines of the Ninth United States Army remained static for a long time, and the 3 Hospitalization Units of the 48th were far enough forward so as not to necessitate movement when the Army’s attack across the Roer River began on 23 February 1945. The shifting of units resulted in First Platoon and Headquarters, still stationed at Alsdorf, supporting the 83d Infantry Division from 26 February; Second Platoon, still at Palenberg, supporting the 84th Infantry Division, as early as 9 February; and Third Platoon, which had now moved closer to the front on 8 February, medically supporting the 102d Infantry Division. Crossing proceeded swiftly with Ninth United States Army reaching the Rhine River on 2 March 1945 and linking with Canadian Forces on 11 March, merely 16 days after the attack had begun. On 6 – 7 March 1945, Headquarters plus all three Platoons moved into bivouac at Dülken, Germany, where they occupied two schoolhouses and several German residences and were able to get some rest. Time was spent checking and repairing equipment and reconditioning vehicles. Then came preparations for crossing the Rhine. On 23 March 1945 First Platoon set up near Issum, Germany, in support of the 30th Infantry Division. The first unit of the 48th Field Hospital to cross the Rhine River, became Third Platoon, which, together with Headquarters “leapfrogged” First Platoon while supporting the 30th Infantry Division and eventually set up at Friedrichsfeld on 26 March. After 48 hours, it remained the only American hospital to function east of the Rhine, where it received casualties from six different divisions. On 29 March 1945, Second Platoon moved to the vicinity of Paddenberg where they treated 12 casualties from the 17th Airborne Division and the 2d Armored Division. During the fighting for the Ruhr Pocket by both First and Ninth US Armies and the period from 4 to 14 April 1945, First Platoon moved to Buer on 6 April in order to support XVI Corps and attached troops; while Third Platoon moved toward Hamm on 9 April to medically support elements of the 95th Infantry Division and the 8th Armored Division. With the final stages of World War Two drawing to a close in the European Theater it soon became evident that Field Hospitals would no longer be needed for close support of Clearing Stations for which they had been mainly used. The Allied Armies were moving fast, casualties were light, and victory seemed imminent. On 16 April Second Platoon moved to Recklinghausen, Germany, to act as a holding unit, taking over 16 patients from the 20th Field Hospital. On 19 April 1945 Third Platoon entrucked for Münster, Germany, where they would function as a station hospital. On 26 April Headquarters plus Second Platoon moved to Bad Oeynhausen, to operate and supervise a recently captured German Lazarett. First Platoon went to Herdringen on 30 April to take care of overrun German Military Hospitals (as Allied Armies started overrunning Germany enemy Military Hospitals were captured. Although intended for the German Military they also held Allied PWs and forced laborers as patients. The enemy patients, now PWs, required such treatment as accorded by the GC; while medical care was left to the German medical personnel, the hospital administration was taken over by the US Army. As such, the Hospital personnel were responsible for rendering adequate reports and information for obtaining the necessary medical supplies and equipment, and for drawing and distributing rations and fuel for heat –ed). In order to become more centrally located, they entrucked for Hemer, Germany, on 7 May. On 23 May 1945, Second Platoon was in Horn, Germany, awaiting further orders. By that time, all three Platoons were stationed in the area to be designated the British Occupation Zone, so a suitable bivouac area outside this zone was picked near Wismar, Germany. On 9 June 1945, Headquarters, Second and Third Platoon moved into that selected bivouac area, followed by First Platoon on 13 June. 48th Field Hospital. Baseball Diamond field in action somewhere in Germany. The man in charge of drill, physical fitness, and sports such as baseball was Sergeant Ralph L. Quesinberry, nicknamed “Coach Q” (after the war he would join Ohio High School as Football coach). Although expecting orders for the end of June, all three Platoons were still bivouacking in the vicinity of Lollar-Wismar, Germany, by 1 July 1945. The unit had meanwhile been classified in Category II, for Redeployment through the Zone of Interior for the Pacific Theater and assigned to Seventh United States Army. However, the need for a station hospital arose in Germany, and on 4 July 1945, the 48th opened such a type of facility where First, Second, and Third Platoon functioned until 10 August 1945, admitting over 1,000 patients (mostly non-battle medical and surgical cases). On 27 August, the organization entrucked for Naunheim, Germany, into civilian homes readily available and deemed quite satisfactory for the forthcoming fall and winter months. During the second half of 1945 varied forms of entertainment and recreation were available to personnel. 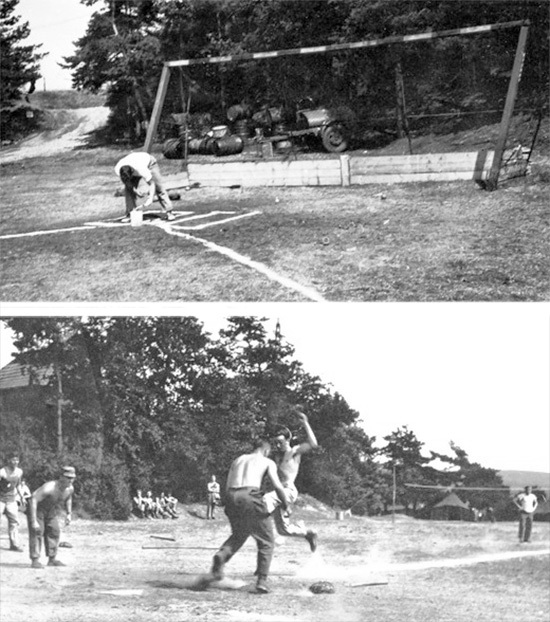 Softball, baseball, and volleyball games flourished, especially while in bivouac areas. Movies were scheduled, beer parlors were obtained to serve as dayrooms. A PX functioned at all times, and special publications as well as equipment were in constant use. Passes and furloughs were distributed, including such places and attractions as Brussels, Paris, the French Riviera, England, and Switzerland. The health of the command was excellent. Staff and personnel were now housed in permanent type buildings with bathing facilities. Messing and sanitary accommodations were gradually improved and rations quite satisfactory and in sufficient quantity. Following the defeat of Japan, the unit was re-designated a Category IV unit with subsequent transfer and assignment of personnel preparatory to departure and return to the United States and de-activation. Lt. Colonel Robert J. Hoagland was transferred on 4 September 1945, and all other Officers, Nurses, and 95% of the original Enlisted Men left the 48th by 1 November 1945! Lt. Colonel Albert E. Herrmann assumed command on 17 October 1945 and immediately made plans for the early departure of the unit from the European Theater of Operations carrying Enlisted Men with an ASR score between 70 and 79 points and Medical Corps Officers with ASR scores suitable for discharge upon arrival in the ZI. All organization equipment, except essential items for the unit’s movement, was turned in, personnel fully equipped and clothed, and required administrative procedures completed for departure from Europe. The 48th Field Hospital departed Naunheim, Germany, 9 November 1945, by rail and motor convoy, moving to the Assembly Area Command, Reims, France. The men arrived at Camp “Baltimore” (one of the many “City” Camps), on 11 November and completed shipping processing on 16 November 1945, departing for the Calas Staging Area, near Marseille, Southern France, arriving on 19 November. Final processing and paperwork was completed with the unit finally embarking for the Zone of Interior, on the SS “Fairmont Victory” (Victory ship launched 25 Nov 44 and delivered 27 Dec 44, hull type VC2-S-AP2 –ed) on 25 November 1945. 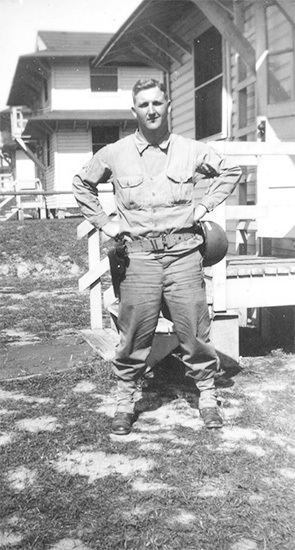 Photograph of Sergeant Ralph L. Quesinberry, ASN 15359295, while serving with the 48th Field Hospital. Our most sincere thanks go to Tom Quesinberry, son of Staff Sergeant Ralph L. Quesinberry (ASN:15359295) who served with the 48th Field Hospital in the European Theater of Operations throughout World War 2. Tom provided the MRC Staff with a large number of photographs which helped them illustrate a concise History of the organization’s service in Europe. His assistance was very much appreciated.